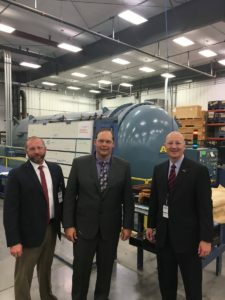 On Monday, October 16th, Royal Engineered Composites welcomed Governor Ricketts and Senator John Kuehn to celebrate Manufacturing Month. Governor Ricketts was originally scheduled to visit Royal as well on October 6th but was unable to attend due to travel complications caused by the weather. Governor Ricketts began his visit with a short presentation about Royal from Royal’s Leadership Team. During this time, Business Development Manager Jarrod Ridge highlighted many of the aircraft programs that Royal supports through its manufacturing efforts. Following this brief meeting, Ricketts addressed Royal’s employees and then toured the plan with Senator Kuehn and Royal’s President, Dave Arnold. “Well it’s manufacturing month here in Nebraska and we’re highlighting great companies that create jobs all across our state,” Ricketts said. Ricketts reinforced the value of a technical degree or even entering the workforce following high school. “Essentially right out of high school or with that two year degree, that’s a great opportunity for our young people to pursue those careers and at a very young age with no debt have great career paths and be able to stay in their hometowns,” Ricketts said. Arnold expressed plans to continue efforts to reach out to younger generation and raise awareness for careers that require two-year technical degrees. Arnold and Royal have worked with the Department of Economic Development (DED) to get involved with local high schools. “There’s a high demand for graduates with technical degrees, and those jobs pay well,” Arnold said. Royal plans to continue to advocate for careers in manufacturing and will maintain their involvement with the local schools.